In my previous post, I mentioned that I'm trying to sew up my stash, since most of my fabric still resides in my daughter's room which used to be my sewing space. I really want to clear it out so there's more room for her things, plus, when I think of something I need and it's after her bedtime, I have to sneak in to her room and use the light of my mobile phone to silently rummage around and find what I need, which is kinda inconvenient... Marie asked where I'm sewing now. Now we have a room that does triple duty as an office, a guest room, and my sewing room. I have a dedicated table set up for my machine, and basically I take over the bed with fabric and patterns anytime we don't have guests. So I didn't help matters today when I came home with 4 pieces of fabric from the thrift store! And that was me being good. I believe all are cotton. (Left to right) The patchwork gingham print was too cute to pass up, perhaps it would be considered vintage, it's certainly older. 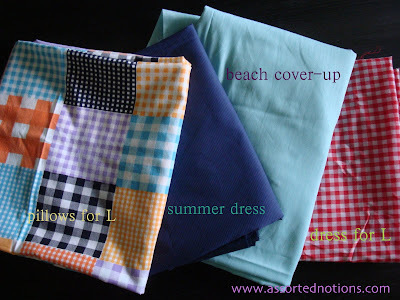 I was thinking it would be fun to make large shaped pillows (heart, house, bunny, alphabet, etc) for L. The navy is a lightweight shirting with a subtle woven stripe, I've been wanting a navy summer dress. The aqua fabric is a sheer woven voile (?) that I'm going to use to make another beach cover-up using BWOF 7-2008-123. We are going to Nantucket at the end of the month so I'm mentally starting to pack (and panic about having nothing to wear) for that. The red gingham will become something for L, because shouldn't all little girls wear gingham? I actually hit the gingham jackpot at the thrift store today - they also had yellow, green (both large checks and small checks), and aqua, and it was all I could do to not buy them all. I'm looking forward to seeing how you get on with that Burda top - I want to make that one too. Ha! I was just looking up the knit dress that you made in this Burda issue last night, and thought that this shirt should be added to my list, but maybe lengthened to a dress. 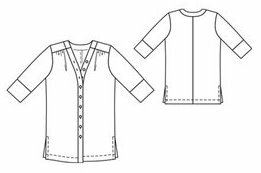 The issue has a dress version of it too, but I think I would keep mine as a shirt dress with the front button placket extended all the way to the hem. Can't wait to see yours finished! cute fabric - I have the same dilemma too about adding to the stash vs. using it all up. At the moment everything is piled high in my wardrobe, but I'm working on organising it, cutting it into patches (I'm a quilter mostly) and getting it filed in a folder... I'm charting my progress (slow start so far!) on my blog: needlepullingthread.wordpress.com. Thanks for your post!